To take it a bit more au naturel, check out this awesome wooded canopy. Swooooon. So fun! 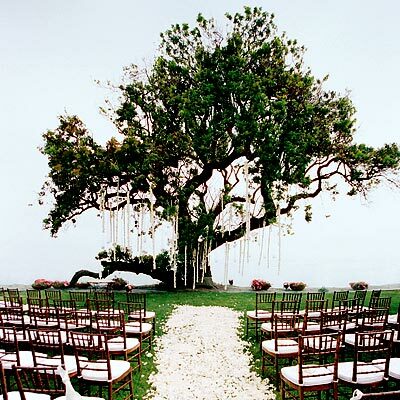 One more element to think about as you craft an outdoor wedding. Which direction would you take your altar? At this moment in time, we're still dreaming about Erin & James' altar (they made it together) - we'd have guests write notes and thoughts from the wedding day and stick them in the bottles for us to read later.